I just finished watching a double feature of Miyazaki films, Tales from Earthsea and Nausicaa of the Valley of the Wind . I didn't say Studio Ghibli double feature because technically Nausicaa of the Valley of the Wind was created before Studio Ghibli was founded, and I didn't say Hayao Miyazaki because Tales from Earthsea was directed by Hayao's son, Goro Miyazaki. Both films have a similar theme of balance with nature (like many Studio Ghibli films), though told in very different stories. Nausicaa of the Valley of the Wind is the very first feature length animated film that Hayao Miyazaki film wrote and directed, and is considered to be a Studio Ghibli production even though Studio Ghibli was created after the success of Nausicaa. Disney released an American dubbed version back in 2005, which I enjoyed but watched only with the original Japanese dialog. Now Disney has released it as a Blu-ray/DVD combo pack, and after enjoying several of Disney's re-dubbed Studio Ghibli titles, I decided to watch it with the English dialog. As with the other releases, the dubbing was fantastic, and used some big name talent like Patrick Stewart, Uma Thurman, Edward James Olmos, Shia LeBeouf, Mark Hamill, and Frank Welker (Megatron!). The art in Nausicaa is not as bright and as crisp as Tales from Earthsea, which is to be expected seeing as how it was made back in the early 1980s, but the artwork itself is still fantastic and I think the duller look really fits into the gritty world of Nausicaa, a world that for a thousand years has been consumed by a toxic jungle spewing poisonous spores, threatening the survival of the human race. 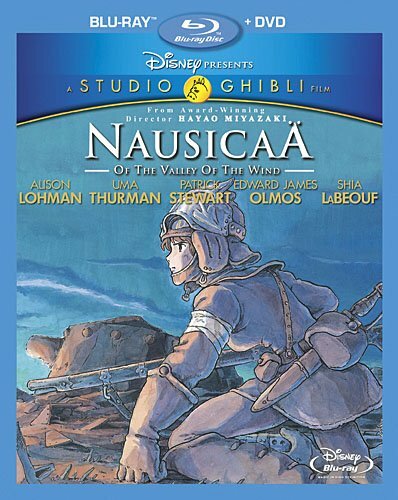 Sure sounds like a downer, but surprisingly it's not thanks to our main character, Nausicaa. Nausicaa is an energetic, optimistic young woman, strong, cheerful, and deeply in touch with nature. She is the princess of her home, the Valley of the Wind, a small town that is relatively protected from the toxic jungle thanks to the strong winds in the valley. We first meet her while she is exploring the toxic jungle (of course wearing a mask so she doesn't inhale any of the toxic spores) and comes across the shell of a huge insect called an Ohmu. And when I say huge, I don't mean the size-of-your-fist huge, I mean the size of a several story building huge! Her people use these extremely hard shells to make tools, so it's a wondrous find. Unfortunately, she doesn't get to enjoy it for very long, as just outside the forest a live Ohmu is chasing someone riding a two-legged creature that sort of looks like an ostrich but with a thick neck and large beak. Nausicaa takes out her gun and fires off a shot, and this is were we start to see a true part of Nausicaa's nature, because she wasn't shooting at the Ohmu, she was shooting a signal shot to the rider so he would know where to go. Then Nausicaa hops on her glider and flies over to help by getting in front of the raging Ohmu, throwing down some stun grenades, and twirling this little wood thing on a string that makes a calming sound. This combination stuns and then calms the Ohmu, who turns around and returns to the forest. It's a great start to the movie, introducing us to this world and our main protagonist, and afterwards her people who are all like her family. Then comes the conflict, which is started when a giant airship from another clan much further away crashes in the valley, bringing with it the potential for destruction. It's the start of an masterfully told story about the balance between man and nature and the conflict between man and man about how to achieve balance, whether it be trying to destroy everything bad or trying to accept it. The emotion that comes through in this film through these characters, all of whom see themselves as the good guys, is just remarkable. The film is nearly two hours long, but every minute of it is worth having. As if the movie wasn't enough reason to own this, there is also a great bonus feature called The Birth Story of Studio Ghibli, which is a documentary about a half hour long which details the origins of Studio Ghibli and how it became such an animation powerhouse. Then there's also a behind the scenes featurette with the English voice actors which is pretty decent. So, there is no reason NOT to own this! Go buy it! Enter the Lands -- Explore the many worlds of Studio Ghibli through this interactive map!